Life’s barely long enough to be good at one thing. 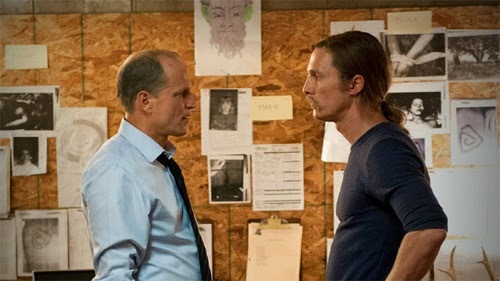 Even though we appeared to be up-to-date, Nic Pizzolatto can’t resist sprinkling a few flashbacks into the penultimate episode. After You’ve Gone is full of great moments, but perhaps a slight step down on the quality of the past couple of weeks. While it’s exciting to see present day Rust and Marty team up, there’s an occasional awkwardness to the character work (how many times do they have to ask what each has been doing for the past ten years?) and it has to be said straight up that the final scene is hopelessly Scooby Doo. Just as long as that’snot a harbinger of the finale. What’s most interesting is that, and it would be a rather unnecessary gambit for him to lie, Rust really has spent much of his time since 2002 as a (not so old) soak, before snapping back into purposefulness in 2010. 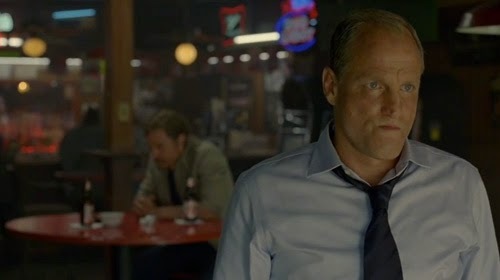 “A man remembers his debts”, he tells Marty, echoing Maggie’s remarks about Cohle’s responsible nature in the previous episode. 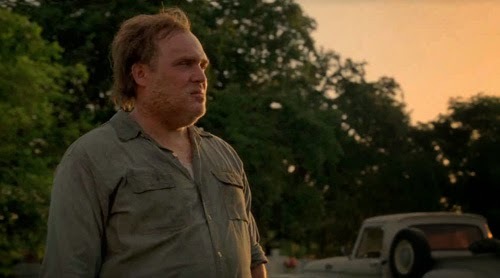 And, for all Marty’s recalcitrance, he recognises the truth of Rust’s urging amid the occasional barb (“You must have really pissed him off” in response to Cohle noting that Time has his way with us all). Rust’s whistle-stop summary of the investigation to date recaps what we already know, but also adds a few events from two years previously. First, his encounter with abuse survivor Toby Boulez, whose attestation to the goings-on at Tuttle schools confirms Rust’s worst fears. Toby imagined it must be a bad dream, partly due to being drugged and partly due to the animal masks worn by his assailants. And there’s the man with the scars round his mouth again. While the emphasis on long-standing evils perpetrated is effective, less so is the referencing of Hurricane Katrina; it’s a lazy fall-back device designed to invest dramatic resonance (“I think he had a really good year” suggests Rust). Rust’s conviction isn’t the be-all-and-end-all in persuading Marty. He warily brings his gun along to Rust’s lock-up, and notes of his one-time colleague “It’s like you’ve been alone too long”. Rust’s honesty at least is reassuring; he too wondered if it was all in his head but, “That time passed”. 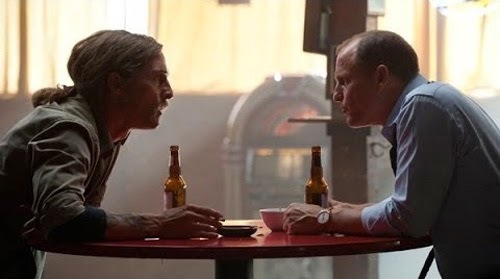 It’s the other flashback that seals the deal for Marty, who goes from concern over whether Rust offed Tuttle to grim determination to see this thing out (Cohle latter professes not to know the details of Tuttle’s demise, conjecturing that his associates took him out behind the woodshed and put him down when they assumed he would be blackmailed; this isn’t wholly convincing, and we’ve seen before how well Rust is able to lie to Marty). 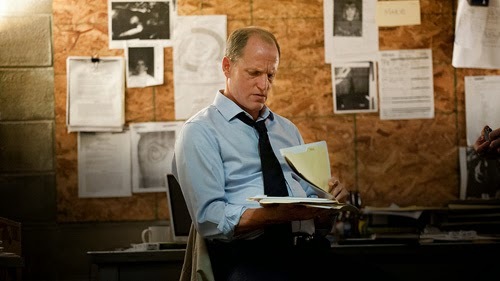 Harrelson is outstanding in the scene where Marty watches the videotape evidence of abuse Rust took from Tuttle’s safe, any lack of resolve evaporating. Most of the sequence plays out on the actor’s face, and it’s quite sufficient to tell the story. Marty suggests Rust he shouldn’t have the tape (for his own safety, presumably) and Rust replies “Nobody should have this”. If Rust’s sharpness may have been somewhat blunted over the years, or at least his energy, Marty has also changed. Perhaps he hasn’t become a better man, but he’s more conscious of his failings on all levels. No longer a young buck, his evenings are spent alone with a beer and TV dinners. And his visit with Maggie is curious, to say the least. She asks him if he came to say goodbye, as if she has been expecting him to make a final (as in mortal) exit for some time. Unless she just puts two and two together as the likely outcome of reconnecting with Rust. But it’s still a strangely low-key scene. As if Marty is an old cowboy off to his last stand, one that has been heralded before anyone even realised that’s what it was. And Marty too gets his flashback, a particularly unsavoury reminiscence involving a microwave oven to explain his decision to exit the Force. It’s actually Marty who does the lion’s share of the gumshoeing. He sets Rust up in his office (business clearly ain’t good) and scours old police files, goes golfing with Sheriff Geraci (Michael J Harney), while Rust (a persona non grata) tends bar. Rust is only called in when its time to break out the car battery and two jumper cables. The interplay between Geraci and Marty, both studying the other’s lies, is almost as strong as between Rust and Tuttle in the previous episode. The overt “True Crime” referencing by Marty was unnecessarily meta when he persuades Lutz to let him look around old police files, but it just about travels. If After You’ve Gone’s most unsettling scene is the one in which Marty reviews the tape, the one most beholden to the show’s mythology occurs when the duo visit Miss Delores, who worked for the Tuttles (this after another validation of the man with scars from Jimmy Ledoux). She confirms the general dodginess of the Tuttle family, and granddad Sam Tuttle’s “other family’(the Childresses) before recognising Rust’s drawings of the wicker totems. 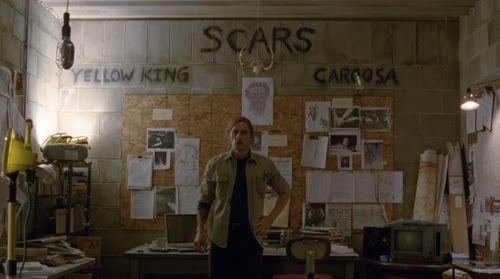 “You know Carcosa?” she asks. “What is it?” questions Rust. “Him who eats time” responds Miss Delores kind of awesomely (time again). Perhaps this eerie occultism will go unexplained, how disparate people have insight into an unknown realm (albeit those who do seem to be in altered states, be they pharmacologically induced or a consequence of neurological diminishment). That might be appropriate; the glimpse at something that may or may not have more to it is frequently more compelling than a clear answer (see also Lost). When Rust concludes that “She sure made sense to me” her niece responds, “That should worry you, mister”. And the auguries are not promising for the ex-detectives. But if Marty seems almost resigned to his fate, Rust appears to be looking forward to an exit. One with finality attached. Which is why he’s less than keen to hear the old lady promise “Death is not the end, rejoice!” Of course, since she is referencing Carcosa and we’ve already had it implied that existence is some kind of Sisyphean circle, which we are condemned to repeat throughout eternity (notably, Marty would rather she was incorrect), Rust has good reason not to be optimistic. But his intimation that he wants to finish all this up “before getting on with something else” suggests a project or journey; there’s not much planning in just topping yourself, unless there’s an additional passage through the great beyond. The other notable Rust moment comes with Maggie’s visit to his bar. After the fireworks she set off last week, Monaghan is relegated very much to an incidental role here. Marty at least has no desire to rock boats any more, but time has not tempered Rust’s contempt. His dismissal of her with “It never sat right with me then, and it doesn’t now, you asking me to lie to you about him” is uttered with steely contempt but it still seems like weak sauce. He’s pissed that she wanted his comfort over Marty’s indiscretions, when his caustic insights into human nature really should have accepted her behaviour as elementary and completely comprehensible? I hope Maggie has more screen time next episode, as she’s been too integral to just ebb away. 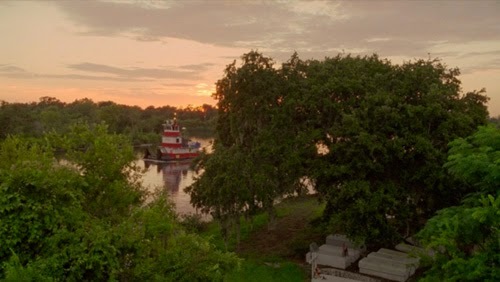 Of course, if speculation regarding Marty’s daughter and extended family are brought home to roost, rather than left to drift (and since they send some viewers on the most extravagant of theories, perhaps that would be just as well), she will inevitably prove to be a vital component (if any such eventuality should come to pass, I expect Woody will be a ringer for Brad in Seven and I don’t mean he’ll find her head in a box). Which brings me to another circle. The hitherto absent detectives Gilbough and Papania ask directions from a lawnmower man with a scarred face (Glenn Fleshle, another Boardwalk Empire alumni) who appears to be mowing circles (yes, a bit of overkill there but don’t worry there’s even more of that to come) amid a graveyard. So, as with the third episode, the police are too distracted to investigate the prime suspect under their noses. 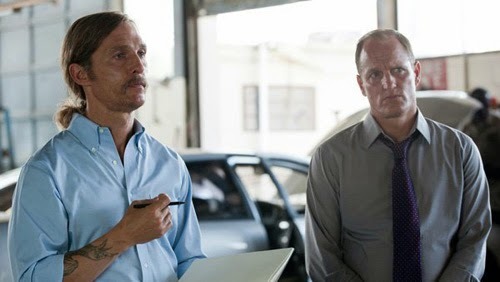 Which does rather raise the question of the quality of the true detective work throughout. Are they just intentionally not very good? Any of them, even Rust with his penchant for eliciting confessions? They break the law, convict the wrong people, and seem to only make progress by having lucky clues fall in their lap before the trail runs cold again. In the space of 17 years continually haunted by an obsession Rust has done bugger all apart from mull it over and mull it over some more. It’s very lucky he never thought to go and chat to the lawnmower man properly, but then I guess there wouldn’t be much mystery. 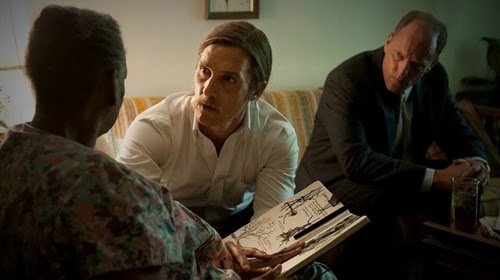 It ties in with Rust’s earlier, “Life’s barely long enough to be good at one thing” (As usual, there are some great lines, usually drawled matter-of-factly by McConaughey as if they’re just been lying in the dirt waiting to be snuffled up and shipped out). 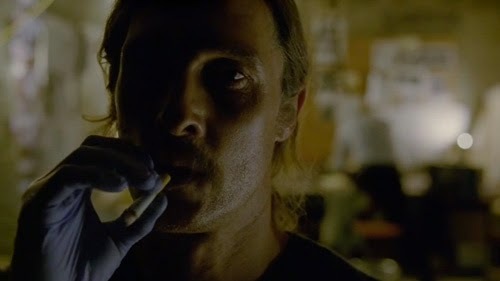 Finally, then, there’s there moment when Pizzolatto and Fukanaga plunge headfirst into a cauldron of fondue. Mower man Errol all but looks into camera as he utters after the retreating police car, “My family’s been here a long, long time”. Yeah, ditch that restraint and classiness on the last lap guys, you’ve earned it! The sad thing about this is, not only is it a silly line, but it’s staged for maximum undermining of menace. There’s nothing ominous, threatening or scary about Errol on his mower. Especially not dribbling crap like that. Still, just as long as he turns into that much-awaited green-eared spaghetti monster next week all will be forgiven.